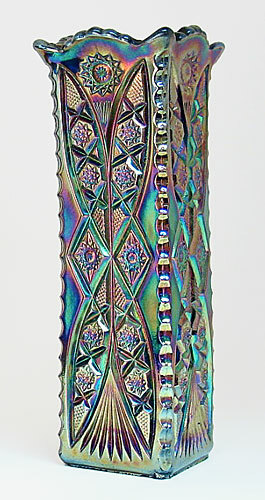 This vase has the typical ground base and lustrous iridescence of the German maker, Brockwitz. It is much like another vase attributed to Brockwitz, Regina Star. This one is also called Column Flower. This 8 1/2-inch vase in blue sold in 2002 for $600. Two more brought $275 and $450 in 2005 and a 9-inch version in blue sold for $275 in 2007. Also known in marigold.